Apple boss Steve Jobs has said that outside developers will now be allowed to make add-on software for the iPhone. The move follows criticism that Apple was previously not allowing outsiders to make programs that would run easily on the popular mobile phone. 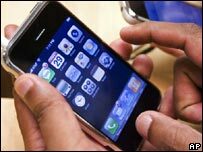 Last month Apple warned iPhone users not to hack into the gadget to install unauthorised programs. Apple said that such moves would render the phones "permanently inoperable" when it releases software updates. "We are excited about creating a vibrant third party developer community around the iPhone and enabling hundreds of new applications for our users," said Mr Jobs. He added that it would take until February to release a software development kit (SDK), as Apple both wanted to "provide an advanced and open platform", at the same time as protecting iPhone users from viruses and privacy attacks. The SDK will also allow developers to make applications for the iPod touch, which uses the same underlying architecture as the iPhone. Apple has played a cat and mouse game with hackers since the phone's launch, with programmers battling the protection on the device in order to install third-party programs, such as games emulators, net telephony applications and turning the gadget into a remote control. Apple has also faced criticism that iPhone users cannot choose their phone network. Instead, those in the US have to use AT&T, while UK users are tied to 02. In France the iPhone will have to be sold with and without a contract, according to the country's laws. Orange is the exclusive carrier for the phone but under French law phones must also be supplied unlocked for use on other networks.